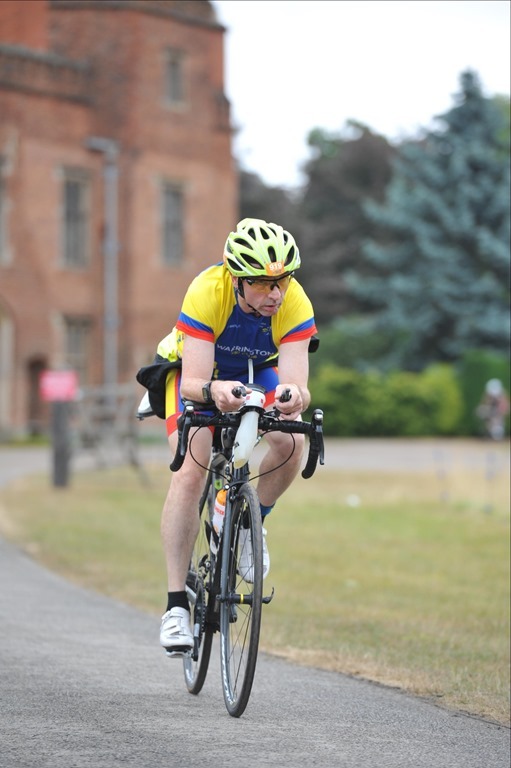 They say that 60% of your tri training should be on the bike as that’s where you are going to be spending the majority of your race. I’ve been putting it off as it’s horrible and boring. I finally bit the bullet, cleaned out the shed and set up the bike on the torture device/ turbo trainer. I did one session after my epic run the other day. It was good training but I was sweating and panting, kept pausing to take drinks and generally make excuses to rest for a second. I had it in a low, mostly manageable gear, apart from the 5 minutes in top gear. I kept trying to shift up, to build muscles and stamina, but quickly dropped down again. On that session I ended up opening the shed door to try and let some cool air in as I was dying. I’ve had time to think about it though, and now I’m keeping the door closed. It should keep the gnats out, which is a bonus, but my main goal is heat conditioning. I’m thinking if I start now, plan in regular training sessions, and work through autumn and winter, as it starts getting warmer I should adapt. In theory. 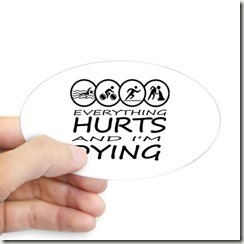 If I’m looking to an end goal of the Barcelona or Hamburg Ironman (even two out of three of my Outlaws have been in blistering heat) I need to heat condition. More for the run, to be honest, but surely that will carry over? Anyway, I did another session today, with the door shut. I’ve got a big fan there, but as part of my new masterplan I’m not using it. And I’ve stumbled across a successful training plan. I remembered at the gym on on their kit you can do stepped training plans, say for 2½ minutes at one level, then up a level, down a level, etc. Instead of just pedalling in a do-able gear and keep stopping I timed myself. I settled on 1 minute per gear up, 5 minutes in top gear, then 2 minutes down the gears. The only difference is mental, but struggling in, say, 5th gear, knowing you’ve got another 6 to go, all harder, is too much at the minute. So, 1 minute up, 5 in top, 2 minutes down. Again it’s just mental, but because I wasn’t just churning away for an hour, I kept going. Instead of thinking “45 minutes to go, I can’t do it”, I was thinking “only 2 minutes, then it gets easier” Once I’d stumbled on the stepped plan (a few minutes in) I didn’t stop. The sweat was running down the back of my legs. Everywhere else as well, but literally running down my legs.That’s not normal for me. Pure gross. By the end of the hour the condensation on the shed windows was running. I’ve just ordered a cheap thermometer, I want to know just how hot it’s getting in there. I’m a mite concerned about rusting my tool in the shed. I’m hoping an hour sauna, 23 hours to air, will suffice. I have encountered a few set backs in my training. I didn’t reckon on it being a bank holiday today, so no swim lesson, and next week week we are on holiday, so I’ll miss that one as well. It’s going to be a fortnight before I get to see who is right about this swim coach, and what he thinks about my chances. The other delay is my feet are too badly damaged to run. Which is a total bummer because I am really excited to see how fast I can get over 10 miles. If I could do 10 miles at 7 m/m (not inconceivable) I expect I could maintain pace for the extra 3.1 miles for an actual half marathon race. Those little blister-ey scrapes on the pictures I posted have turned into red raw ½” x 2” open wounds. They are still weeping. 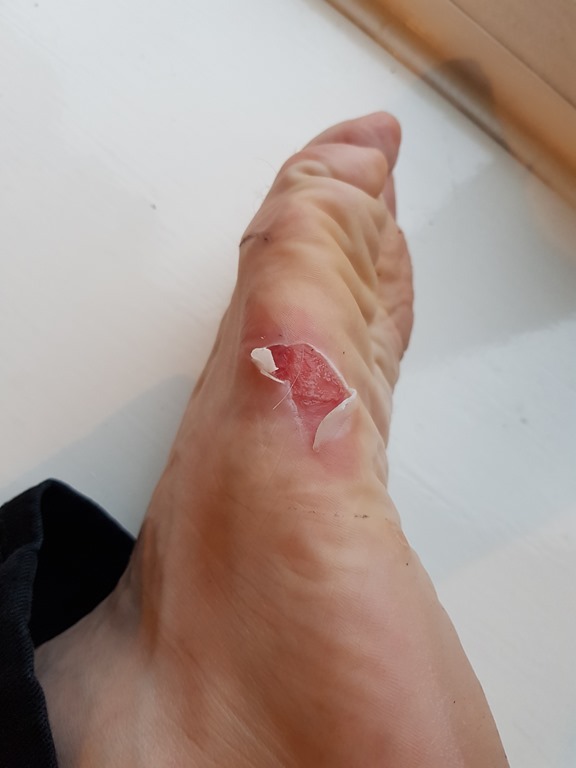 I’m hoping by tomorrow I’ll have a proper layer of skin so, with plasters, surgical tape (to secure the plasters) and socks (big, fat, lovely socks!) I can run. A good test would be the Warrington half marathon on Sunday the 16th of September, but my holiday request got knocked back because it’s full. I have discovered a plan B though. I can request a shift swap. With myself. So I have the Sunday off, then work one of my rest days. I’ve got to talk to the planner tomorrow, but I’m hoping I’ll get it. Then the Manchester half in October. I’ve already got that booked off. I am going to batter that one. 1 hour 30 or die trying. Well, the thing to take from all of this is I’m training hard and I want to train hard. I can build the muscles and speed for the bike, a fast marathon is the “easy” discipline. It all hinges on whether I can learn to swim. I am really getting focused on my training. I’ve cleaned out my shed and set my bike up on the turbo trainer. I did a session yesterday and today. I did this week’s task of 2½ miles at race pace the day before those. So today, before the hour on the bike, I decided to go for a fast test run. I thought that the professional triathletes didn’t use socks, thus saving a minute in transition. Transition is the easiest place to save time, you don’t have to use any muscles to not put a pair of socks on, so I gave it a go. The good news is I battered my times. I did a 10K (seems that’s a popular reference, I still work in imperial) in 45:13 and 10 miles in 1.12:20, knocking 2 minutes 11 seconds off my previous PB from June ‘15. Well pleased with that. I was aiming for a 7.15 m/m pace, didn’t go above 7.21, mostly below 7.15, with a 6.59. To be fair to myself, that wasn’t the course on which I set my previous PB, I think it’s a bit harder. I’ll try again on that course for a like for like comparison. Hopefully shave a bit more off. 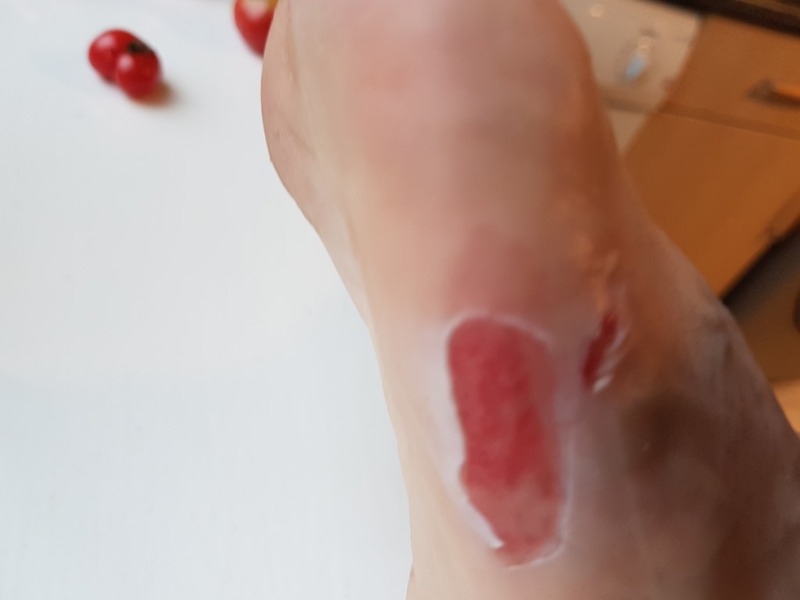 So I destroyed my feet for nothing. Live and learn. That little faux pas aside, I’m buzzing off today. That was a good run, I maintained a fast pace for the full ten miles, then did an hour on the bike. Which seems to have set itself harder. I have done an hour grinding it out in top gear before on the turbo before now. Today I did a 5 minute section in top gear and I was standing on the pedals having to use my lardarse to move the damn thing. Which is good. Not that I was struggling, but that it offers such resistance. Great training. Right, to bed to reset. 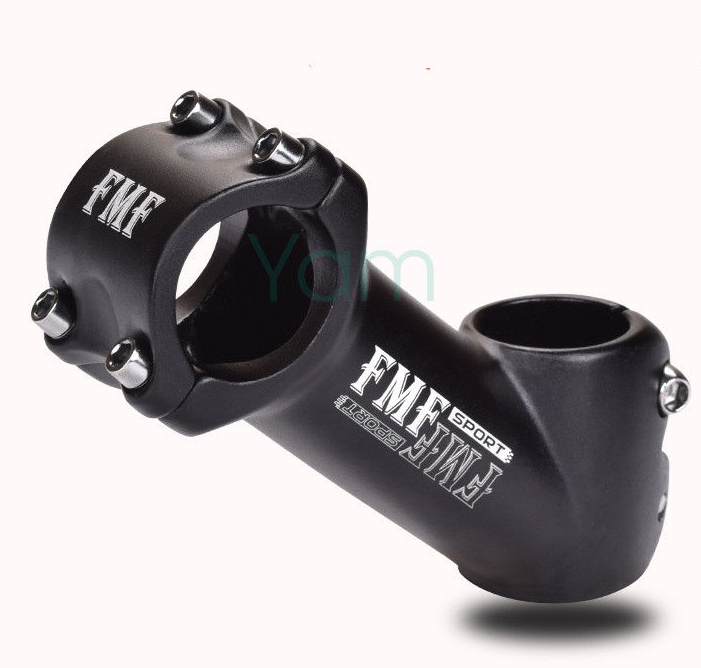 After all my talk of why I couldn’t fit an aftermarket exhaust silencer (“end can”) on my bike I got talking to someone on Twitter. He said to try a certain brand, so I went and looked. They said you could just straight swap the can, no retune, no remapping the computer for the fuel injection. Entirely contrary to what I’d read. They were obviously selling new, expensive cans. I looked on eBay and someone was selling one for £39.99. I waited until the last minute and got my bid sniper bot to put in a bid. Got it for the opening price! Get in! I stuck it on yesterday and compared it with a decibel app, not much louder, one or two Dbs. Super. While I was fitting it I had a look at some other stuff. Apparently the exhaust is fitted with a butterfly valve, so it blocks exhaust gases up until 3,000 revs (making it quieter while you are warming the bike up, and, not coincidentally, making sure it meets industry emission standards at test levels) then opens up to make it racier when you are starting to rev. That is a good feature by me. I can warm my bike up without getting lynched, bike goes RAAAAAARRRGGGHHHH! when I open it up. The confusion lies in the fact that the computer that runs the fuel and the butterfly valve is set up to run with the back pressure of a standard exhaust, remove that and things go pear shaped. This is where Power Commanders come in. They are a plug in jobby that, by some techno voodoo, makes the computer do the right fuelling for any specific set up. The trouble is they cost about £300. I looked under my seat to try to locate the servo (motor) to the exhaust (butterfly) valve, and there was a power commander! Woo-hoo! 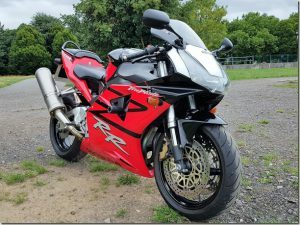 I was told this bike was stock, that was a fib, but if it saves me shelling out £300 I’m OK with it. So, three components: end can, exhaust valve, power commander. I have to say I’m out of my depth. I have no idea how to synch the three. I looked online for a fancy garage that does dyno testing and remapping in the North West, and the best one is in Warrington! 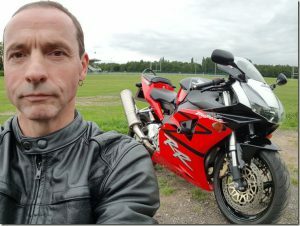 You know how I took my VFR800fi in to a fancy garage, they took a week or so to service it, but the back brake still felt funny? So I rang them up and accused the highly skilled mechanic of not doing his job? Then found out Honda have linked the brakes on that model so no matter how hard you stand on the back brake it won’t lock up? So I had to ring back and apologise? Anyway, I’ve booked it in for next Friday. They said they can stick it on the dyno and check if the fuelling is working for that set up (£45), if not, they can remap the power commander (£150 in total). That’s still less than £200 all in. For a nice end can and a properly tuned bike. What I don’t want is to scrimp and blow my engine up. I’m well happy with that. The other thing is I’ve committed to the cheapo option on my tri training. I’ve ordered the Klingon Bird of Prey handlebars (£60) some fancy brakes for that style of handlebars (£10) and that 45 degree stem(£10). That’s it. Oh, and I’m having to swallow more humble pie and do what Wendy said in the first place, go and get a pair of properly fitted cycling shoes. And a better helmet at some point. No rush for the last two though, I don’t wear a helmet for training and my shoes are bearable over shorter distances. So £80 and my bike should put me in a proper aero position. 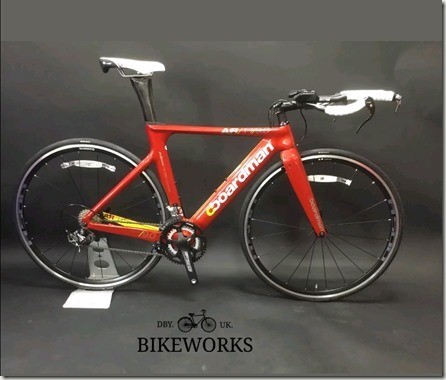 Somewhat cheaper than the £2,600 (FOR A PUSHBIKE!) 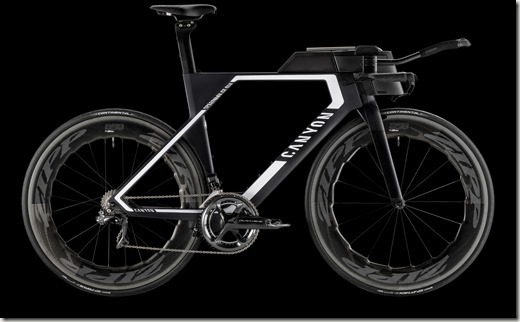 dedicated triathlon bike over which I’ve been obsessing. They say the rider is 80% of the drag on the bike, so if I’m in a full aero position the difference shouldn’t be that huge. Once I’ve tuned the engine to max (my legs) I’ll worry about tweaking the bike. The last thing is the running. My arbitrary training plan is to just run a bit longer each week at race pace (6.45 m/m) and build up. 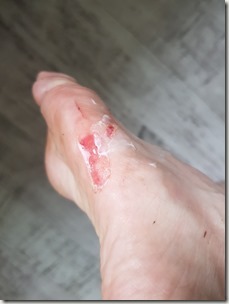 I’ve discovered a safe way of doing that is to run the first mile slow/ steady, the second faster, the third faster again, then slow down and catch my breath then do the fast miles. So far this is working. I set off flat out, but quickly burnt out so just slogged it out. On the bright side, after taking the breather the 2½ mile didn’t seem half as bad as the 2 miles I did last week. Something to note. When I got home and checked my stats. The first mile was 6.31! 6.31! In the past when I’ve been training at a target pace, (8 m/m I seem to recall) as I put in more miles I got quicker. Well, say I was training for a marathon, I could do a 10 mile run way quicker. I’m hoping, prematurely, that the 6.31 was a sign I’m getting used to the pace. More ups and downs with my training. I went out for this week’s fast run on Saturday and just had nothing. It was shameful. I don’t know whether it was starting off at race pace, not fuelling properly beforehand, wearing too hot clothing, all of the above or nothing, but I just couldn’t. I ran 1.6 miles and had to stop and get my breath. I turned around and came home. I was devastated. On Sunday I got an early finish so forced myself out. I was going to do the 8 mile run I’d done the week before. Set off at a relaxed pace for a mile, a mile faster, faster, a mile breather then belt it back. 8.37, good start, 7.23, good, faster, noticed I was doing 6.45 pace, sod it, let’s do it! No breather, straight into race pace! I did the first half mile, turned a corner onto a straight and the wind was in my face. I had to dig in and really push, got 6.46, turned around and had to get my breath back at race pace. I had to use every mental trick I have to keep going (it doesn’t hurt any worse, just keep going to the corner, to that lamp post, done a mile and half, that’s three quarters, this is furthest I’ve done at this pace, another quarter mile and I’ll quit, etc) did it in 6.44. Redeemed myself. I had to stop for a few breaths, then continued at a jog for that mile. Got 8.10, OK, it’s back on, upped the pace again 7.32, and an extra .3 of a mile to make it a 10K in 47 minutes. All in all, pleased with that. The other good news is after noticing my position on the bike on that picture I’ve given it some thought and think I’ve got it. There is a 4 inch bar that connect the headstock to the handlebars. I’ve ordered one on a 45% angle. (£10! Get in! Somewhat cheaper than a £2K+ TT bike.) Flip it upside down, that’s an inch drop for the handlebars. 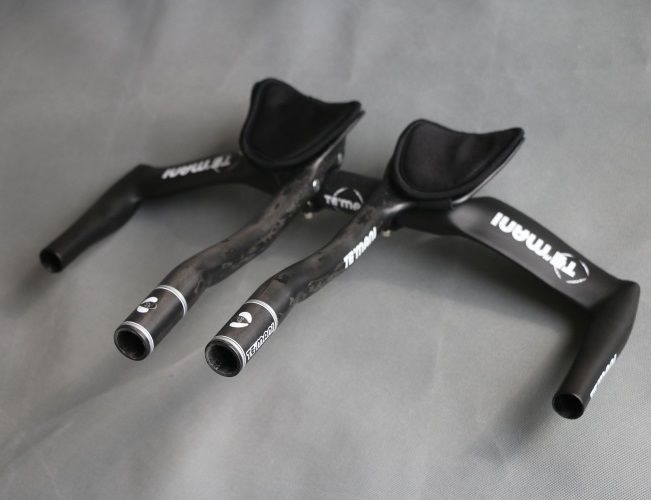 If that’s still not enough to get my back flat I’ve seen some handlebars where the elbow rests are basically resting on the handlebars (mine are an inch above) that would be £60. And they are way cool. They look like a Klingon Bird of Prey. That’s the brand name ones, but I have just discovered Chinese rip-offs on eBay. Hopefully that will do me for a season, strip my bike down to basics, get a proper aero position, fitted shoes, and I should be good to go. That’s running and cycling on track. And I started my swim lessons! And I went! The regular guy wasn’t there, so some young girl was taking the class. I quickly got bumped up from ‘crap’ lane 1, where I said I should start, to lane 3. She said I was much better than I’d made out. That doesn’t inspire confidence, for a start. I don’t think she addressed what I need, (getting the breathing technique, sighting, fluid stroke) but she was OK. I was still waiting for next week for the proper guy, then I got talking to the two others in my lane. They were both triathletes. the chap does sprint distance, the woman half Iron distance. They said they’d been coming a while and didn’t think they were any better. They did spend most of the lesson stood up chatting to each other while I thrashed up and down though. I’ll wait and see how it works for me. If it’s not what I need I’ll quit and join a proper swimming club. They say for best results swim with swimmers, run with runners. I don’t think I will, not at my age, but it got me thinking. I looked at the times a sub 10 at this year’s Outlaw would have put me best in my intended age group (55-59) *and* best in 50- 54! Oh I hope this isn’t pie in the sky. Imagine actually winning something! Me! 3 years of pure graft, but, if I can get the swim training I need, I think it’s *just* possible. I’ve started on my next two impossible challenges. Going sub 3 hours for a marathon, then going sub 10 hours for a triathlon. I’m hoping to get the sub 3 in April on the Manchester marathon. I’ve made a training plan and it *just* has me running half a mile extra each week at the blisteringly fast (for me) pace of 6.45 m/m. I accidentally started at a mile instead of half a mile, so this week I did 1½ miles to keep it up. That’s not all the running I’ve been doing, obviously. My long run last week was 18 miles, today I’ve just run 20. This is going to have to stop. 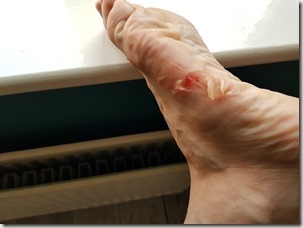 It’s a brilliant exercise in mental toughness and discipline but it is horribly painful and I’m risking overuse injury. Also it’s really discouraging to struggle so badly on a long-ish run and have your pace drop right off, when you are aiming to be going longer and faster. I’m thinking now that the sub 3 is going to be so hard I may have to accept just getting faster this time, then do it next time. That’s as nothing to my second challenge. 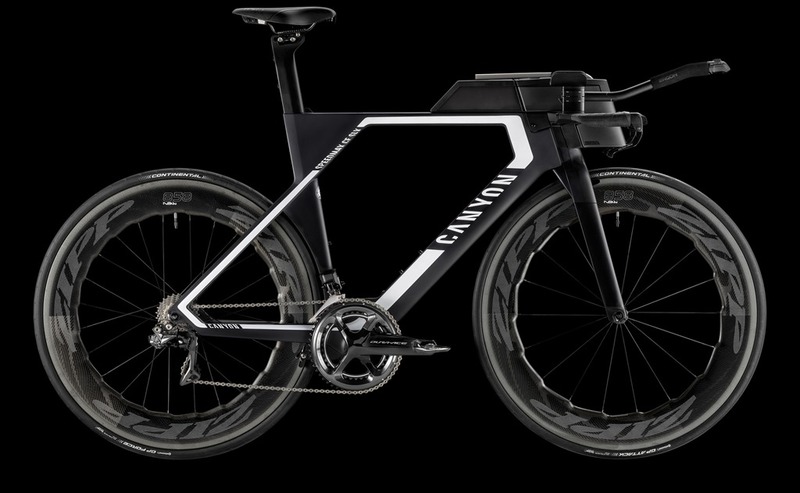 The sub 10 Iron tri. My PB, this year, was 13.17. My swim was 1hr 40, I need to knock 40 minutes off that. Transition 1 (T1) was 11 minutes, need to just run through, 4 minutes max. My marathon was 4hrs 18, needs to be 3hrs 26. Apart from the transitions (just run through) the only one I’m confident I can achieve is the run. I’ve finally managed to enrol with a swim coach at Orford leisure centre. Wendy’s workmate goes to the same class, he says the instructor is a well respected triathlete coach. Apparently he wants to know exactly what you want to achieve, then is brutally honest about whether you can do it. I’ve been giving it some thought, I’m arbitrarily setting the bar at 3 years. I’m thinking: I’m 52 now, I can get fitter and stronger but my body will get older and slower. It’s not a battle I can win. I reckon I can force my body to do as it’s told for another 3 years, beyond that I’ll have to wait and see. I will be telling the coach then that I want to do a 2.4 mile swim, in an hour, within 3 years. If he says it’s not possible I’ll still train and try to prove him wrong, but at some point I’ll have to lower my sights. I hear competitive knitting is the next big thing. All of this may come to nothing. I may never even get a sub 3. I always have unrealistic expectations of what I can achieve. Then I achieve it anyway. It’s going to be a sad day when I am forced to accept I’m too old. I’ve already accepted that I’m never going to win a marathon race. It’s stupid to think I ever could, but a few years back I couldn’t see why not. The coach is away this week, but hopefully I’ll have some sort of answer a week Monday. If I can’t get the swim, I can’t do it. 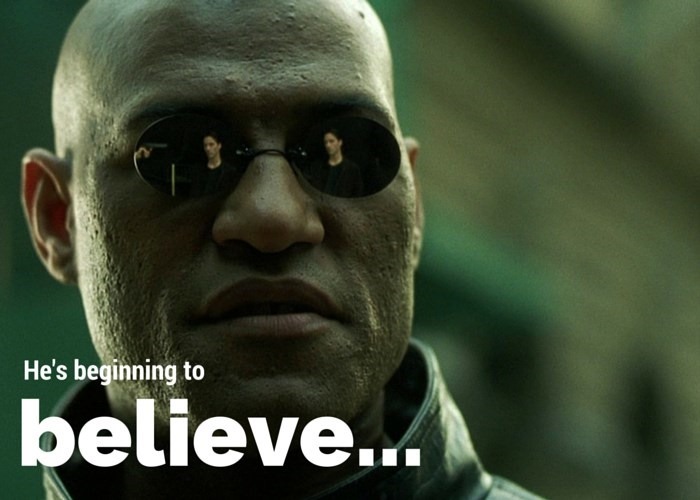 If it’s a maybe, it is ON! I’ve got a beastly hard turbo trainer for the pushbike, put in many, many hours of that, go sub 3 on the run, It’s still possible. One thing that did cheer me, in an odd, ‘this is going to cost a fortune’, way, was a video I saw on YouTube. Two cycle journalists comparing a standard Raleigh racer bike with an aero bike. 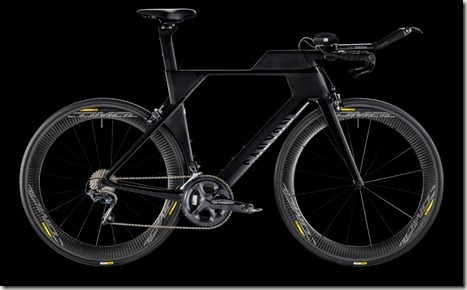 The fancy pants one was full carbon frame, weighed 5 kilos less and had aerodynamic wheels and a sleek frame. Their question was does it really make a difference? EIGHT. THOUSAND. THREE HUNDRED. AND NINETY NINE POUNDS! I’ve told Wendy when I’m in the top 10 in the world I’ll get one. I’m not doing anything yet, but if I am showing any signs of being on target, this time next year (or the year after) I’ll get on eBay and get a second hand bike. Not that one, obviously. It’s the end of the season and loads of people are saying “sod that for a lark” and selling up. I feel their pain. So much so I knocked this up. Well, I bought the bottom bit, cropped it, and added the Outlaw logo. Not exactly rocket science, but I’ve never tried to do anything like it before, so I was quite pleased with myself. 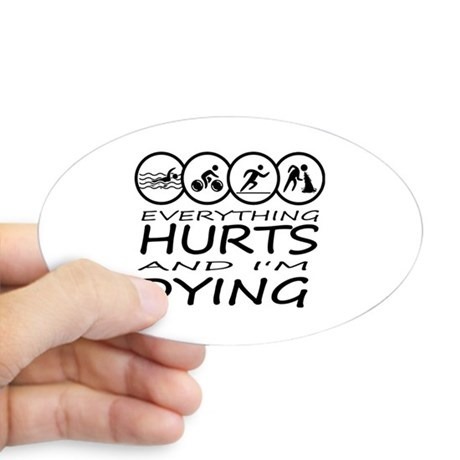 I’ve bought some sticky back sheets and made it into stickers. The only other thing is the FireBlade. The complete package of settings for the shocks worked a treat and it’s a really stable and confidence inspiring ride again. And such an awesome beast. I’ve started doing 6th shifts again this week. The ‘Blade cleaned us out. Now it’s the end of the season I could do with going back on to long shifts and raking in huge amounts of cash, but times are changing with the buy-out, and I don’t know if they’d be so accommodating if I asked again in a few months. Plus there’s the constant messing them about. I should have known. I booked my swim lessons to start on Monday, knowing I’d not had a long shift in ages, ended up doing a 13 hour shift. Typical. I’ve been doing 7 to 10 hour shifts for ages, hardly any overtime. Suddenly a 14hrs15, 13hrs, 12’s.. In a way it’s what I wanted, to get a quick boost of cash, but suddenly I’m struggling to train again. Also, I’m enjoying the FireBlade so much I don’t want to pushbike in to work. One downer, I was watching other videos and reading up, and the consensus is that was a bogus comparison of bikes and performance gains. They say the aerodynamics are vital, of course, but the rider is 80% of the drag, the bike is only 20%. The test bikes were a racer, which has the rider sat up, against a tri bike, where you are hunched right over. 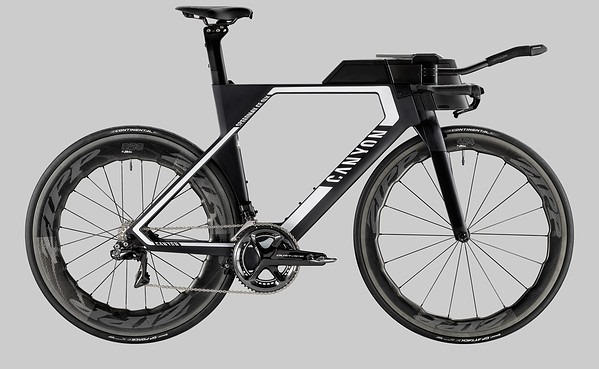 As some people pointed out, a fair test would have been a road bike fitted with clip on aero bars (like mine) vs the tri bike. Once you are in an aero tuck, then you can compare gains. Still better though. 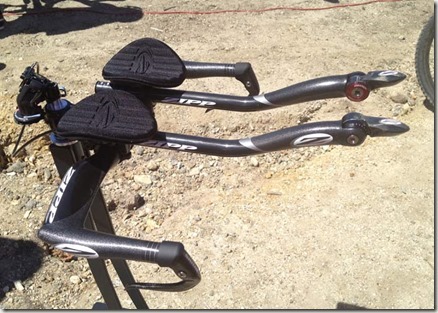 A clip on aero bars road bike is always a compromise in position, a TT/ tri bike is dedicated. Look at the difference. Even on my tri bars I’m at 30- 45% angle, the pro is flat. 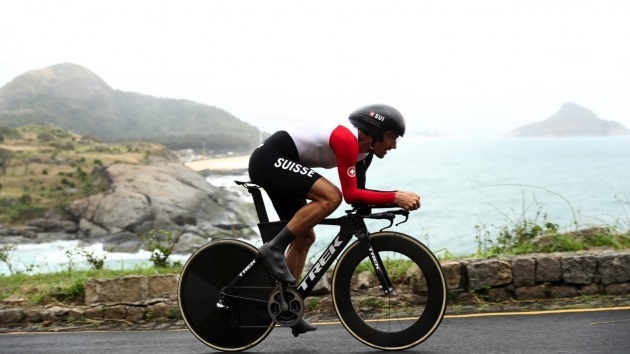 I’ve just watched a video from some Time Trial world record holder, he was saying he was churning out loads of power, then tweaked his position, put less power down and went faster. It’s basically free speed. Well, once you’ve paid a few grand for the bike it’s free. For now I’m thinking of different handlebars. Something a lot lower. 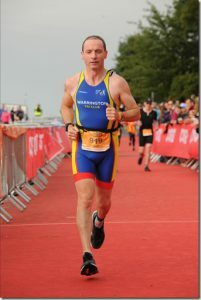 There were only two good pictures of me from the Outlaw. Every other picture looked like a sad, beaten, old duffer who was half dead . Which, to be fair, is 50% better than I was feeling. The ‘Blade is as much art as function. Someone spent a lot of time and effort making it look that good. I’ve been weighing up the pros and cons of that exhaust endcan. It’s titanium so very light, but huge and too quiet. Apparently their are all sorts of sensors built in to the exhaust system though, so you really mess with the fuelling and such if just swap the silencer for a more raucous one. Which means buying a full exhaust system (£££££££) and a power commander to sort out the fuelling (£300) and the garage to fit it, probably. I wanted this because it was an unmolested, original bike. It will far exceed my ability as it is in standard form, I’m not going to spend a grand or so just to make it sound a bit fruitier. One thing about it I will be changing is the seat. It’s rock hard.There’s no rush for that though, I doubt I’ll be doing many more miles this year ‘(it’s not seeing salt). But maybe next year, comfy seat, road trip? A quip nip to Germany? I noticed the forks were set slightly differently so I looked it up today and reset them back to standard, then one turn extra to stiffen them up. Also tightened the chain. The other thing I’m doing now is starting training for a sub 3 hour marathon. I spent ages yesterday working out the amount of weeks until the race, the end distance, then working back in a steady and sustainable fashion to my starting point. I drew up a chart of date, distance, weeks to go. If I can stick to the chart I can do it. I went for my first run since the tri today. It was hard and humid. My target time is 6.45m/m. I started off slow to avoid tendon injury, 8.46, 8.27, then tried a fast mile. 7.42. Total disaster. I thought I’d lost my fast mojo. I did another few slow miles then tried again. As soon as my watch beeped for the mile I charged off. It was beastly hard but I kept going. Finished that mile in 6.42! Yay! It’s back on! Then slogged home for 2 miles. I’ll have to see how it goes. I may have to have a slack year (no tri-s) and focus on getting sub 3. And so, said Zebedee, to bed. The forks set up wasn’t a step forward. Over bumps it was trying to buck me out of the saddle. I’ve looked up a complete set up guide for this exact model (there are 6 different things to adjust) and set it to that. Trial and error. If that’s not right there are set-up experts who will fine tune it to your exact weight. Another thing I’ve learned today, never, ever do a long run after a fast one. I ground out 18 slow, painful miles, but it was hellish and dispiriting. The only good to be taken from it is I wanted to quit after the first mile but kept it going. So a good exercise in mental discipline.